Do People Really Keep Pet Skunks? Pet skunks are among the more exotic mammals kept for pets, but they can make very loving, devoted, and playful additions to the family. 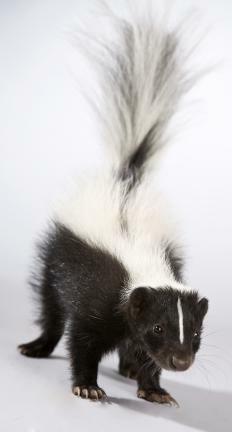 Most people who are curious about these pets are naturally interested in the odor issue, as skunks are infamous for the strong smelling liquid that they spray when feeling threatened. Skunks that are kept as pets have their scent glands surgically removed, usually at a young age, to eliminate the problem. After surgical alteration and being spayed or neutered, a skunk can be a fun member of the family. Skunk breeders can be found in several parts of the world through Internet searches. It is better to get a captive bred animal than a wild one, because it will be well accustomed to being handled, and likely will have already been altered by the time you obtain it. Some breeders select for striking color combinations, and it is possible to find all white skunks, or those with interesting fur patterns at a breeder. If you are considering the introduction of a skunk to your life, you should first make sure that they are legal in your area. In some regions, they are classified as wild animals, and you will need a special license to keep one. If they are legal in your area, make sure that you have access to a veterinarian who will treat this pet. Veterinarians who work with exotic animals will also usually accept skunk patients as well, but you should check on this before bringing one home. When you've established both, you can find a breeder and visit the facility to pick out a skunk. You should select a skunk while it is young so that you can house train it and accustom it to being handled. If you would prefer an older, trained animal, consider getting in contact with a skunk rescue organization, although be aware that some rescue skunks have behavior problems. Select one that looks healthy, with a balanced weight, clear eyes, a dry clear nose, and a healthy coat. Avoid those that look listless or have runny noses and eyes, and do not be afraid to ask the breeder for information about the skunk's parents and behavior. Around the house, skunks can sometimes get into trouble. They are naturally inquisitive animals who like to explore the world around them. For this reason, it's important to skunk-proof your home, moving potentially dangerous items out of the way and taping down cords and cables that the pet could chew on. At night, you may want to consider crating your pet to avoid him getting into trouble. Skunks can be litter box trained, although it take patience and time. Exercise and diet are very important for pet skunks. Captive animals tend to have obesity problems as a result of fatty diets and limited exercise. Provide a balanced, low fat diet with plenty of fiber, protein, and vegetables, and avoid cat or dog food, which are too fatty. Skunks love to play and exercise, especially with people, and a daily romp will help keep the skunk slim and trim. In addition, you can keep your pet healthy with vaccines designed for dogs and cats, and regular check-ups at the vet, just like with any other animal. Have All U.S. Presidents Kept Pets in the White House? How Far Does Skunk Odor Spread? How do I Become an Animal Breeder? How do I Remove Skunk Odor? Why do Skunks Smell so Bad? Can I Keep a Hedgehog As a Pet? Unfortunately in south central Pennsylvania, skunks will be removed if they are in the wild and must be killed. Sad. I have a pet skunk named flower! There is an organization called Skunk Haven in Ohio and he owner takes in unwanted skunks. She is very good with them. You will also be invited to the skunk festival. My internet searches for a skunk breeder have been unsuccessful. Your article says they can be found. What title should I search under? Do you have any leads you can share? Moderator's reply: a search on google using "skunk breeder" netted several links for skunk breeders, adoption, and skunks as pets. happy "skunking!"